Skye Gravestones | John James Black Martin, d. Margaret. John James Black Martin, d. Margaret. JOHN JAMES BLACK/MARTIN/M.A., M.B.Ch.B, M.D., D.P.M., F.R.C.P. (Edin)/1896-1959/3rd son of/The Rev. 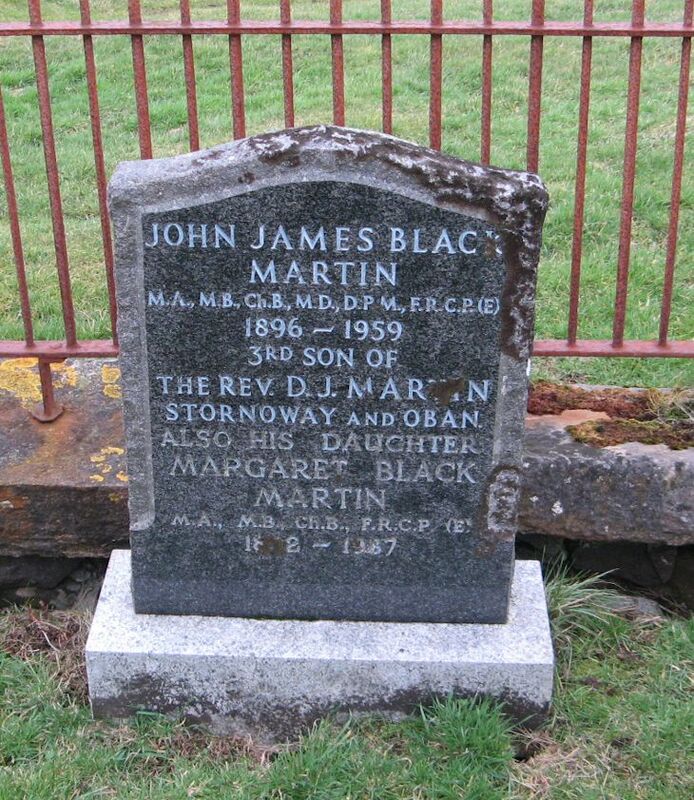 D. J. MARTIN/Stornoway and Oban/also his daughter/MARGARET BLACK/MARTIN/M.A., M.B. Ch.B, F.R.C.P. (Ed)/18-2-1987..
Hi, Margaret was the daughter of Rev D J Martin and Letitia Tennent Martin nee Stuart; John was Margaret's brother. Added by Dr Sarah Craig on 21 May 2018. Thank you Sarah. I noticed that the image wasn't complete. It is now. Added by Roddie Macpherson on 21 May 2018.